This project extends my version 2 6U8A Vacuum Tube Audio Amp by adding a 6C4 preamp stage for higher sensitivity. The preamp allows the circuit to be used as a low power guitar amp, a circuit testing amp or an outboard amplifier for devices like the WB0RIO Piglet 6U8A Regenerative Receiver. The maximum output power of this amp is around 100 milliwatts. This version of the 6U8A amp was originally part of my House Finch Direct Conversion Tube Receiver project, but was separated into a stand-alone unit. This device uses high voltages including 120VAC and 250VDC. The project should only be taken on by someone who has experience working with high voltage circuitry. The power supply should always be disconnected and the B+ line should be shorted to ground when working on the amp. The low-level audio input signal is sent through a 10nF DC isolation capacitor to the grid of the 6C4 preamp tube. The 6C4 is wired as a class A amp with a 1M grid leak resistor to ground. The output of the preamp goes through a 10nF DC isolation capacitor to the 500K volume control potentiometer. The wiper of the volume control potentiometer goes through another DC blocking capacitor to the grid of the 6U8A triode which serves as a driver stage. 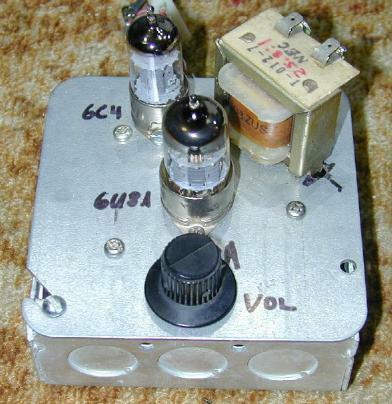 The 6U8A triode is wired as a class A amp with a negative feedback connection on the cathode. The output of the driver stage is sent to the control grid of the 6U8A pentode section through a 10nF capacitor. The pentode is wired as a class-A amplifier with a transformer output. A negative feedback loop linearizes the amplifier's frequency response, it consists of a 120K resistor and 470pF capacitor from the speaker side of the output transformer to the cathode of the 6U8A triode. Feedback is kept to a fairly light level to preserve the amp's dynamics. The R/C network across the output transformer primary insures a flat frequency response. The pentode's screen grid is pulled up to the B1+ voltage through a 1.5K current limiting resistor and is AC-bypassed with a 10nF capacitor. Power to the amp comes from my Power Supply for Vacuum Tube Experiments, which is set for 160V DC output. The B+ supply goes through a three stage RC filter which progressively isolates the lower level amp stages from the output stage. The amplifier was built onto a standard 4"x4" electrical utility box cover plate. The plate was the type with a conduit knockout in the center. The knockout was removed and two small holes were drilled on either side to hold the 9 pin 6U8A tube socket. A second hole was drilled and filed to fit the 7 pin 6C4 socket. Several 5/32" holes were drilled in the box cover plate to hold the terminal strips. A hole was drilled in the top of the box to hold the volume control potentiometer. The potentiometer could also be mounted on the front of the box. The various resistors and capacitors were connected between the tube socket and terminal strip pins. A standard Romex style cable clamps was used on the utility box for securing the power supply wiring and coaxial audio input cable. A standard 1/4" phone jack could be mounted on the front of the box and used for the audio input. 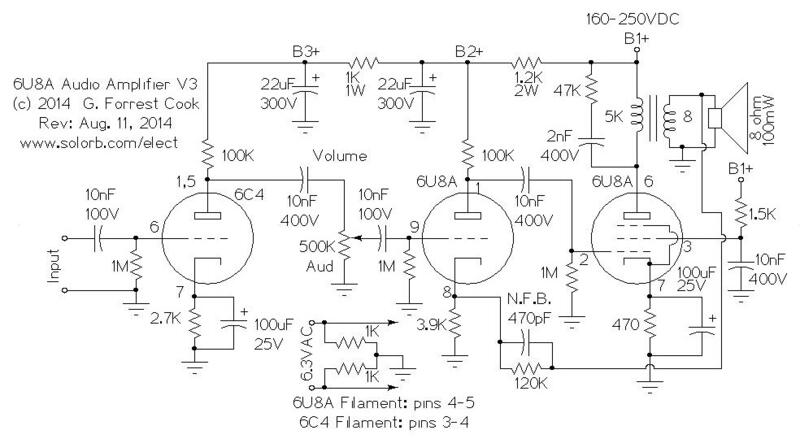 Connect an 8 ohm speaker to the amp's output and plug an audio source into the input. Apply power and turn the volume control up to the desired listening level. The amplifier can also be used for powering low impedance mono headphones, two of the amps could be used for powering stereo headphones.